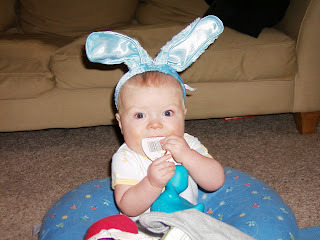 Last Easter......he would NOT cooperate with the ears this year (he must know I will use these pictures as blackmail someday). 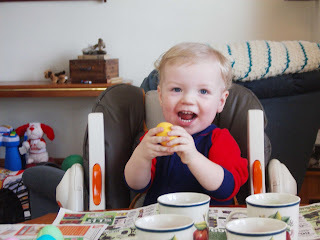 Easter came and went and no blog update....sorry. We enjoyed our Easter and spent it with Rich's family this year. We went up north the following weekend during Rich's and my spring break. While many basked in the sun, we were greeted with mountains of snow....no kidding. We were able to escape the U.P. before the "April Fool's Storm" hit that left behind over 20 inches of snow. We embraced our brown grass and the smattering of snow we still had left knowing it could always be worse (sorry LaCombe family). Yesterday, Rich and I were able to attend the Parent Education Day up at the Wisconsin Medical College. We were able to hear the future of CHW and Herma Heart Center. In April of next year, the new ICU tower should be open. We were also able to attend a session involving research and causal factors of CHD. As there is not one "cause" of CHD, there are numerous associations. One association that just about knocked me over was the fact that the state of Wisconsin has reported 3 times as many HLHS cases than any other state. Also, when looking at the cases mapped out on the state, southeasern Wisconsin was hit the hardest. Of course, this sent many parents asking questions.....the doctors were quick to say that as they dig further into this research process, it opens up more and more possibilities. We hope that in Braden's lifetime, there will be more answers to these questions of how and why? After lunch Rich and I split up into different sessions. I was able to attend the "behind the scenes of the operating room." As much as this peaked my curiosity, I was very hesitant to attend. I sat with anticipation of leaving. Much to my surprise, the session actually relieved my fears and "nightmarish" thoughts about the OR. Rich wished he would've attended as well. He went to the nutrition/fitness session. Since every kid is different, it was difficult for him to get any clear answers regarding Braden's future with sports and endurance. During the day, we were able to see some of the nurses and speak briefly with Dr. Ghanayem. We saw God (Dr. Tweddell), but never spoke to him. What do you say to the surgeon who gave your son his life? We were also able to see many of our heart families and connect with a few more. It was a day filled with excitement, education, emotion, yet promise for a hope-filled future. Thank you all for reading and checking in on us. Your continued support means the world to us. ps....we caught Braden saying, "Whoa dude" today....it must be from Uncle Nick or Auntie Marci.